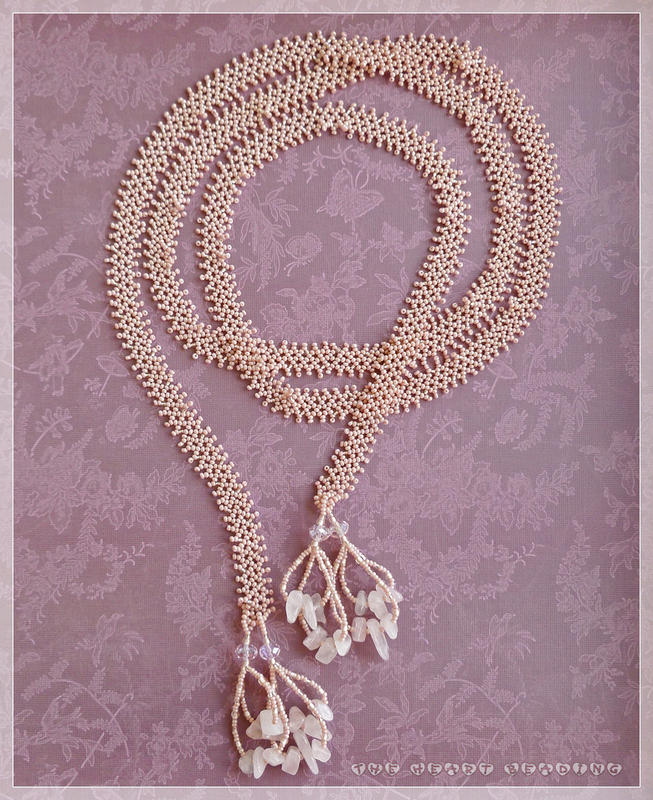 Another work from the book Netted Beadwork by Diane Fitzgerald (read the review HERE). So I made the chain measuring 53 inches (1.34 meter) long. It was a time consuming project, but I found it very relaxing because I didn't have to think much about what I was doing. 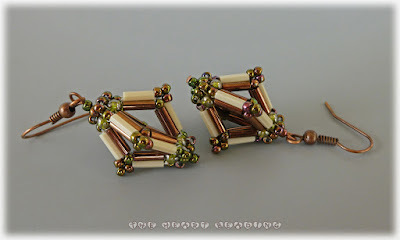 I did the chain with C-lon thread size D and 40 grams of Czech seed beads size 11/0. 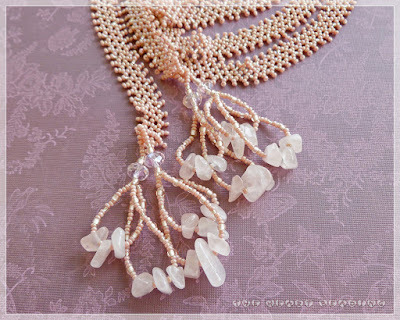 The book doesn't teach you how to finish the necklace or how to add any embellishment. I finished my lariat by adding a loop of 9 beads at each end. 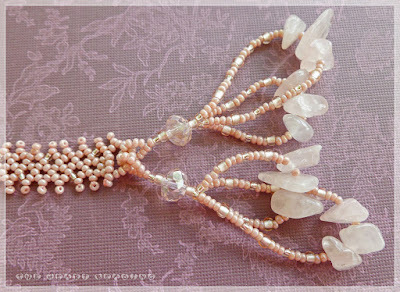 I also created simple fringes with seed beads size 11/0 and 8/0, 8 mm crystals rondelles, and large rose quartz chip stones. Because the chips are a bit heavy, I used illusion cord 0.20 mm. The fringes measure about 2.5 inches (6.4 centimeters) long. 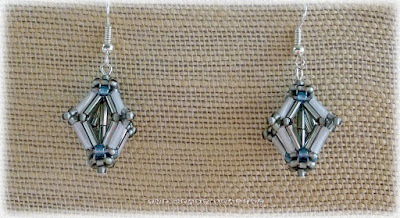 Another version of the diamond earrings designed by Julia Gerlach. 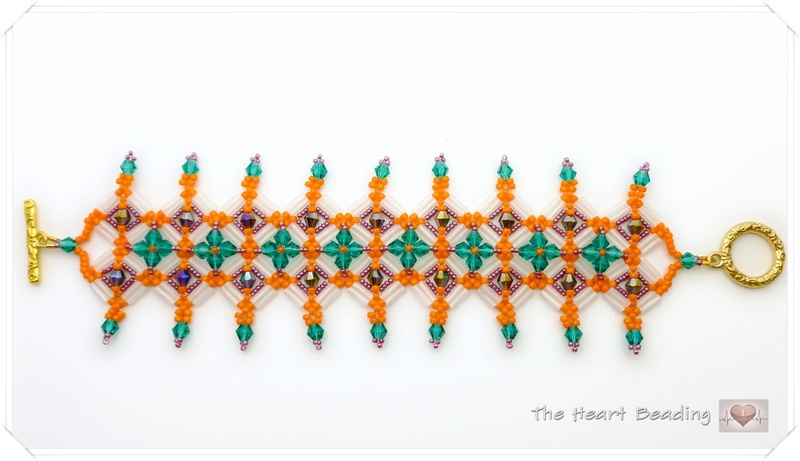 The pattern is in Beadwork magazine, February 2016. You can see the other one I made HERE. I chose a white thread because I thought it would pop up the color of the transparent green beads. It worked as I expected, but the downside of it is that the thread seems much visible to my taste. I believe the black color would've blended better. 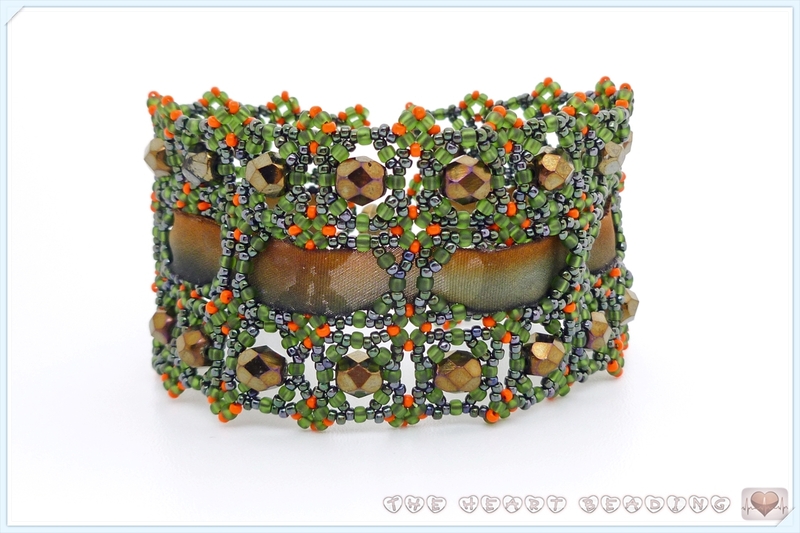 Today I want to show you my version of the Russian Frost bracelet designed by Svetlana McDaniel. You can watch the tutorial HERE. I don't recommend this tutorial for beginners because it's a very intricate and detailed work. I had some difficult to understand a few parts of the tutorial. You need to pay attention to all the steps to know exactly where you should pass your needle. To avoid mistakes, I first watched the whole video and I wrote down the instructions with my own words. Then I got all the materials I needed and sat down in front of my computer. I worked following the video and the instructions I wrote. 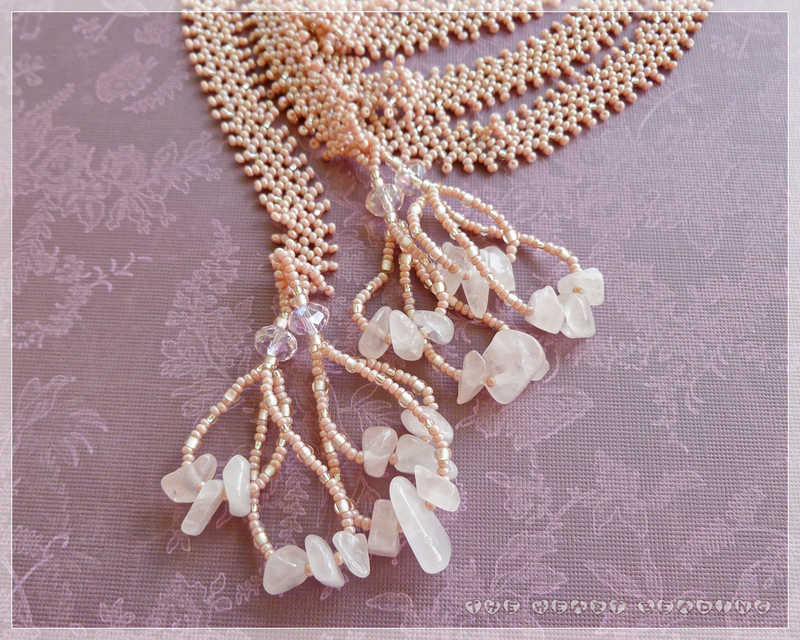 I also think that I made my job more difficult by choosing a mixed color of seed beads instead of working with one single color. But I have to say that I'm very pleased with the result. The bracelet is beautiful and it worth all the work! The tutorial is divided in two parts. 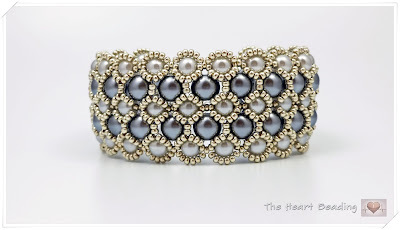 In the first one you'll learn how to make the center of the bracelet. 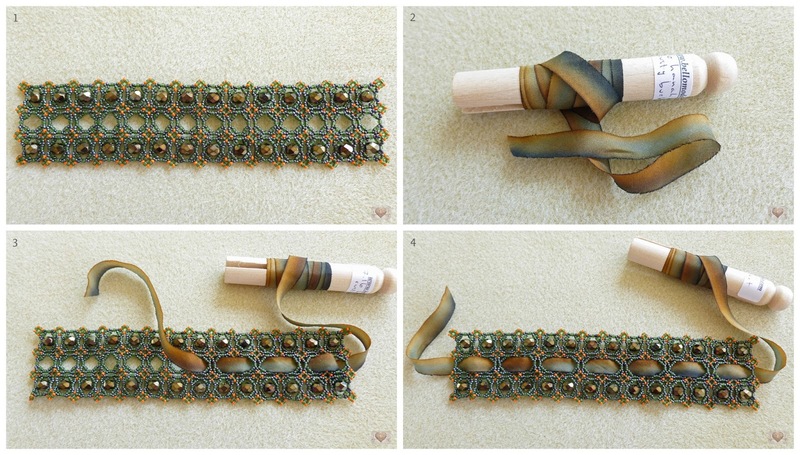 In the second one you'll learn how to make the bands and how to attach them to the center piece. 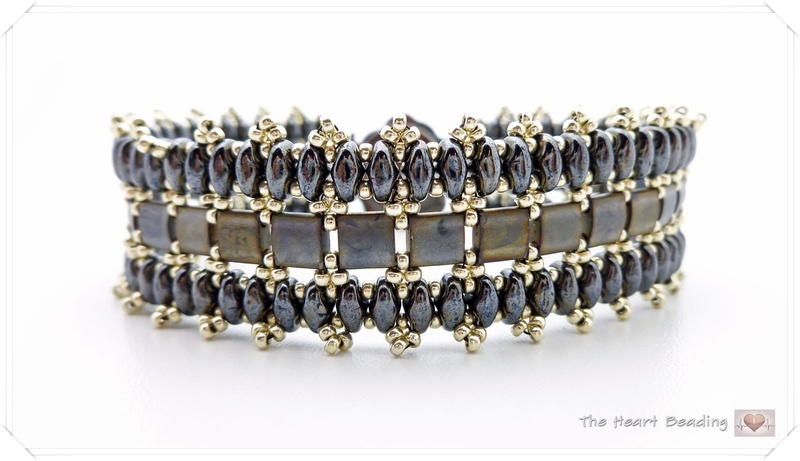 Without the clasp, the size of the bracelet is 5.5" (14 cm). And with the clasp I used, its finished size is 6 3/4" (17 cm). If you want it larger, you can add a chain of jump rings at the end, or you can create four motifs (or more) instead of three in each band of the bracelet. 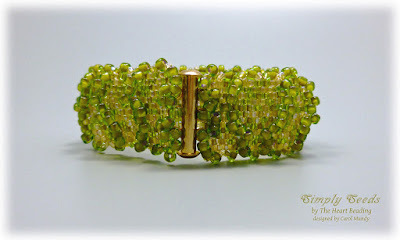 Today's review is about the Simply Seeds bracelet designed by Carol Mundy. 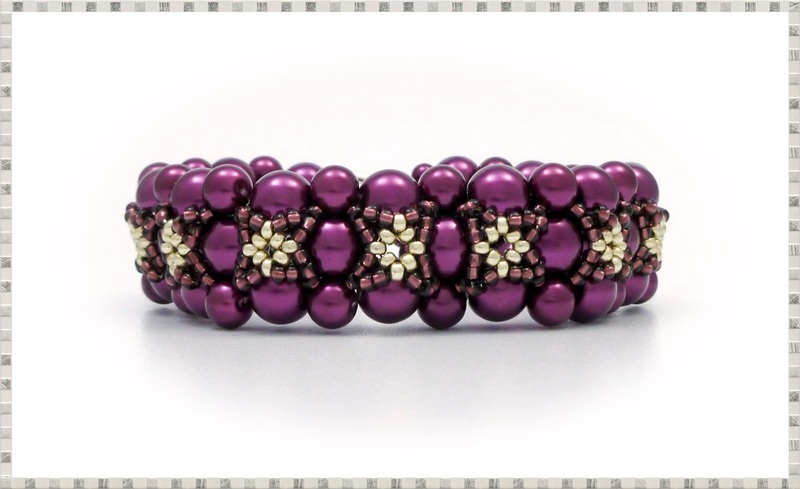 The pattern was published in Beadwork Magazine December/2012. 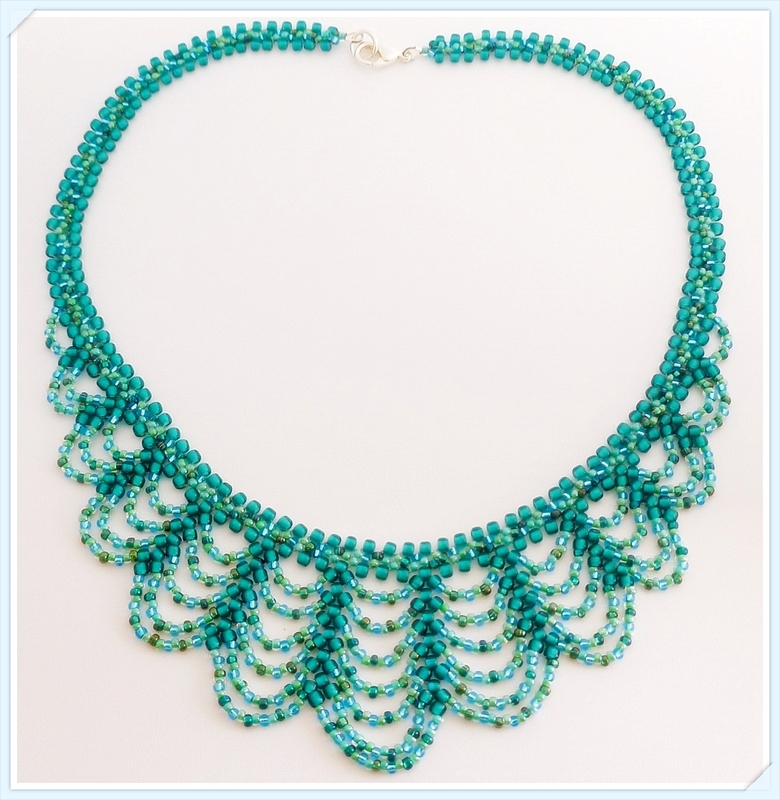 I chose this pattern because I love designs that uses only seed beads and I also wanted to learn how to make ruffles with peyote stitch. 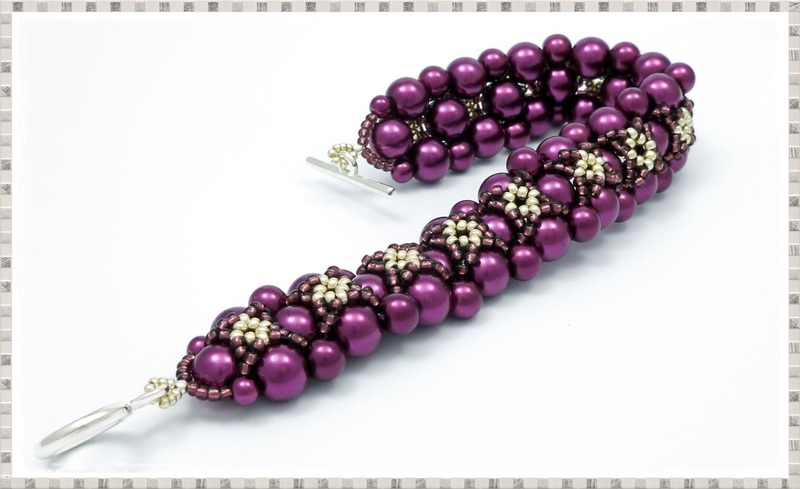 And because I didn't pay attention to the bracelet's finished size, I worked only the number of rows specified in the pattern and my bracelet ended up too short for me (it measures 6 1/2" or 16.5 cm). 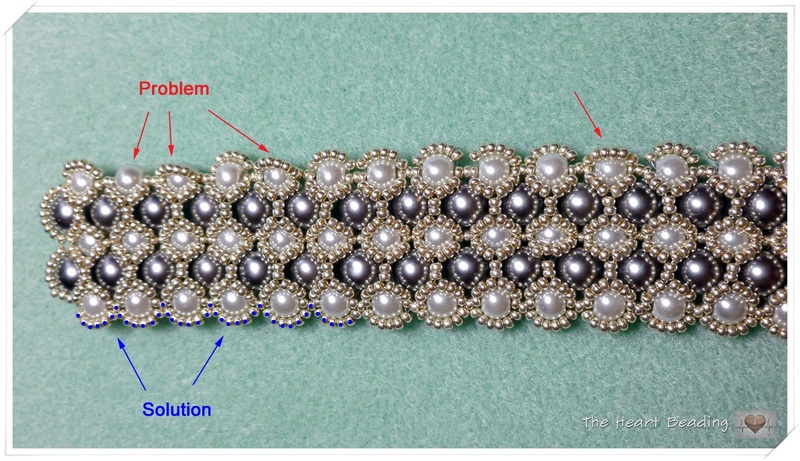 So if you want a longer bracelet, you'll need to work more rows than the number called in the pattern. 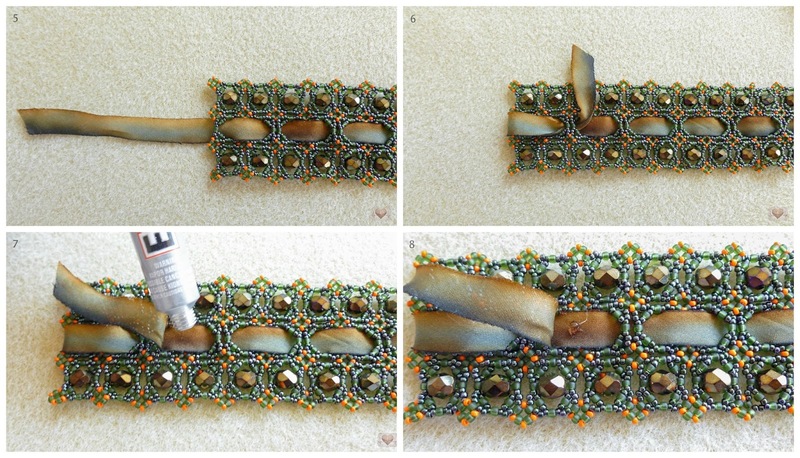 To make the base in peyote, I used a mix of round seed beads instead of cylinder beads. And to make the ruffles I had to use a tight tension to keep the beads in place. Unfortunately I don't have the link for the beads. I bought them at Fusion Beads and they were discontinued. 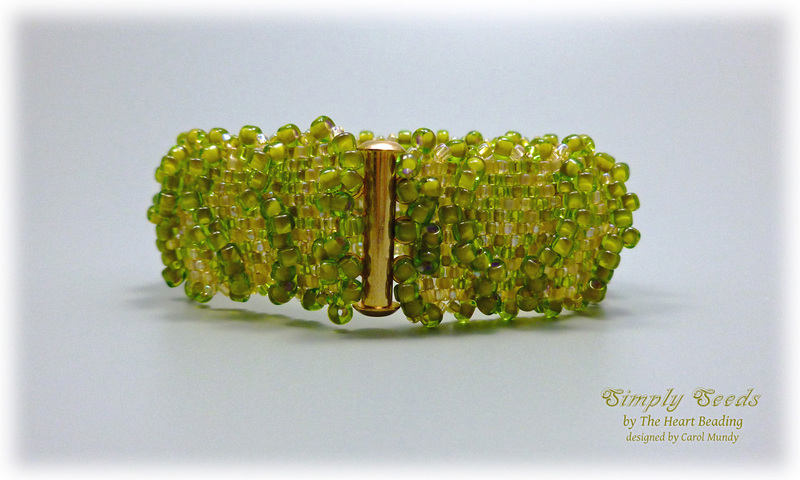 Here is what I did yestarday: some beadwork designed by Sidonia. If you don't know her, check her Youtube channel HERE. I'm a big fan of Sidonia's designs. 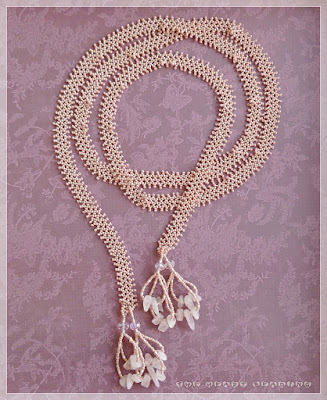 She creates beautiful and delicate beading jewelry using seed beads and Swarovski crystals. I like the way she combine colors, making her designs have a sophisticated look. 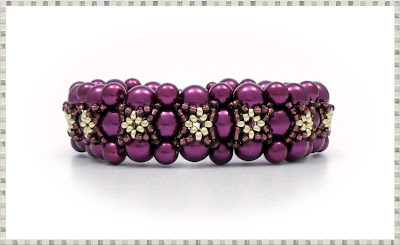 The first project I made is the Losange bracelet and earrings (watch the bracelet tutorial HERE and the earring tutorial HERE). It's easy to make and I totally recommend it for beginners. 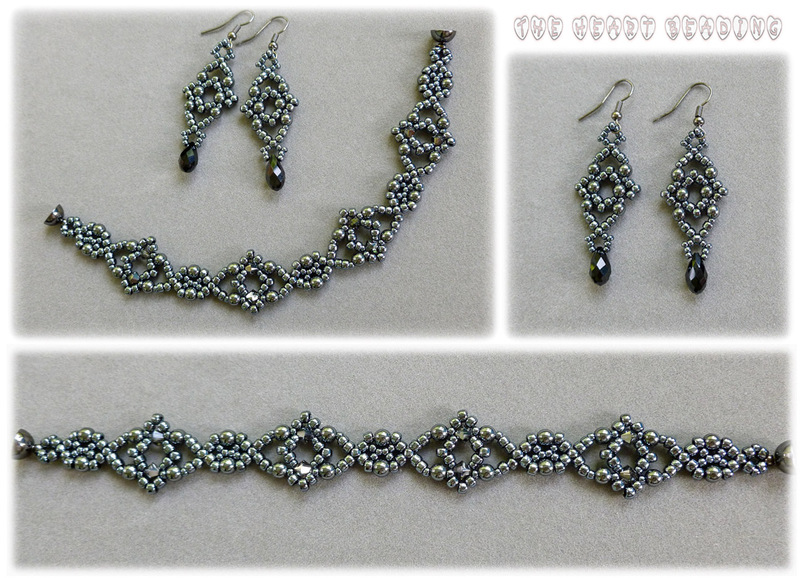 Because the design is lace, I decided to use seed beads in gunmetal color, to create a contrast with my skin and show the details better. 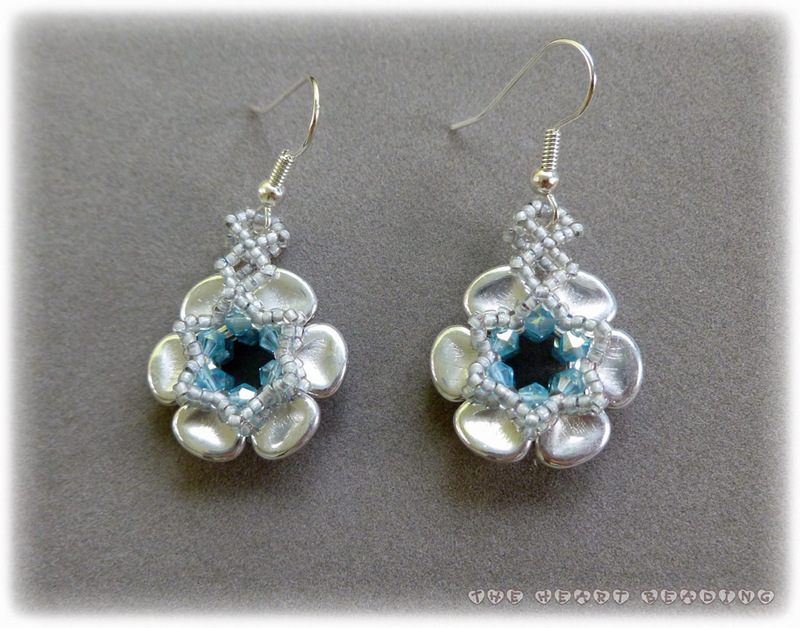 The second project, also from Sidonia, is the Rose Petal earrings (watch HERE). I bought some Czech rose petal beads quite some time ago and I didn't have any idea to use them. So when I saw this tutorial, I couldn't be happier! Finally I put those beads in good use. 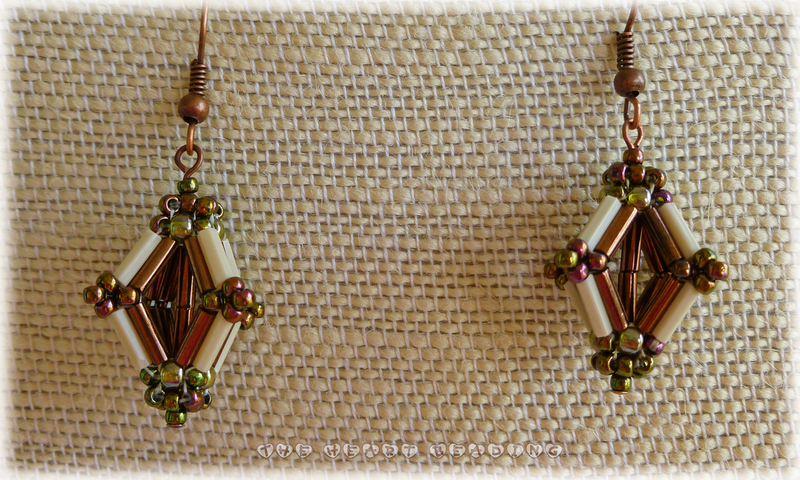 The earrings aren't difficult to make. But if you don't know right angle weave stitch, you may get confused, especially when Sidonia explains how to place the petals so they all face to the same side. 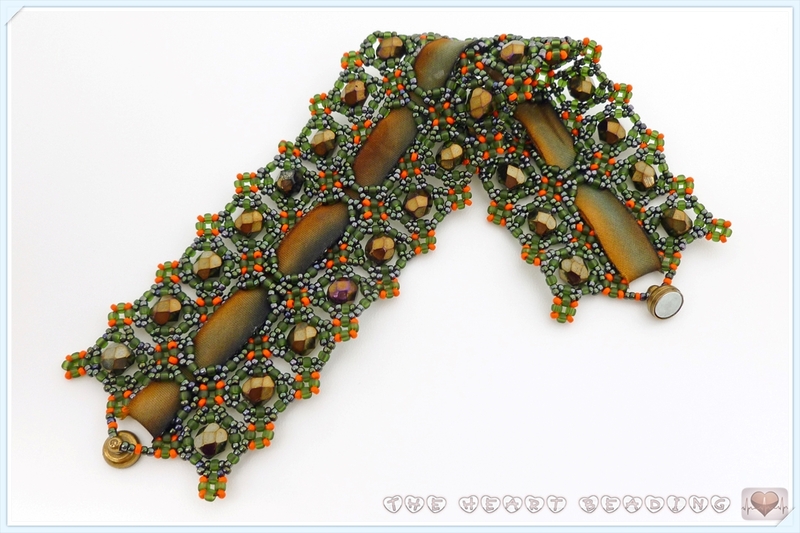 This is my version of the necklace designed by Maria Rypan that was published in the Beadwork Magazine June/July 2014. 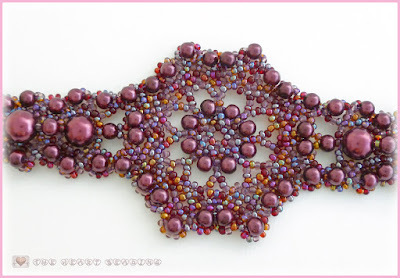 I love this pattern because it's quick to make and I could play with beads of different colors. To see the scheme to make it, click HERE. Although this pattern is quite simple, I don't recommend it to beginners. It's necessary you have some practice by reading diagrams and know right angle weave stitch. 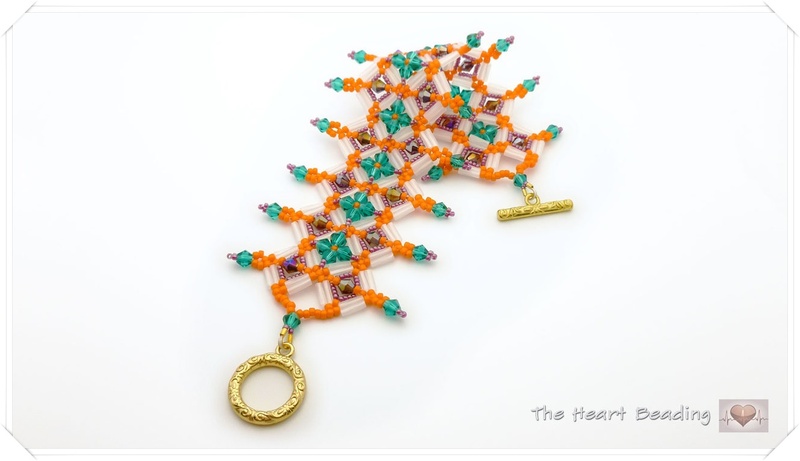 I had a problem at the time of joining the ends of the bracelet. 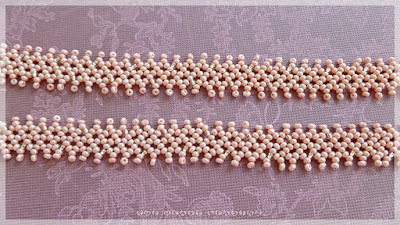 I thought that I had aligned the bracelet correctly, but when I was almost finishing the embellishment I discovered that I couldn't join the end of the embellishment with the beginning because they were misaligned. The result: I had to undo the entire bracelet. The embellishment correspond to the first one in the image 5 (in the original scheme). As you can see in the image above, the embellishment was made in three columns of the rope. 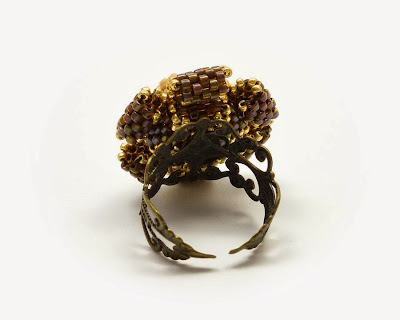 We don’t do anything at the other two columns because they'll be the internal part of the bracelet - the part that will be in touch with the skin. As you can see, the embellishment makes easier aligning the ends. 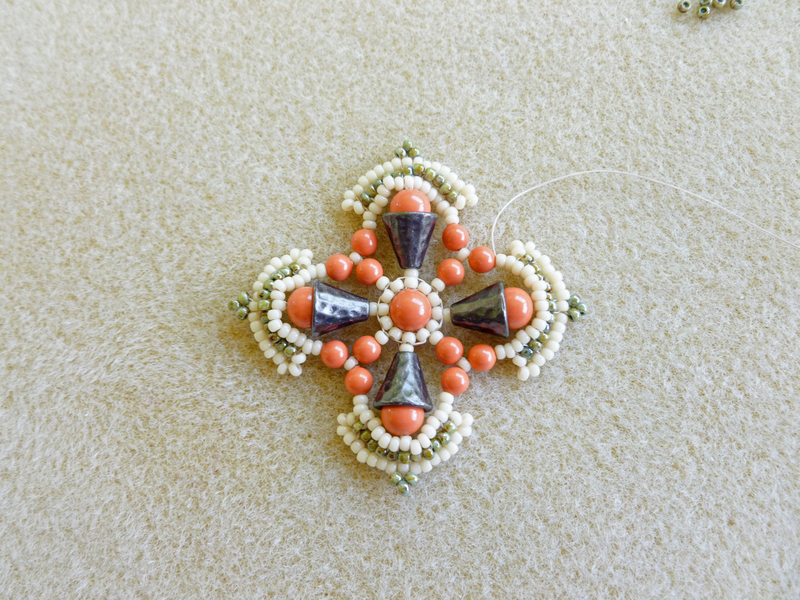 After that you can continue doing the other part of the embellishment. I want to share with you the result of a pendant I made yesterday. 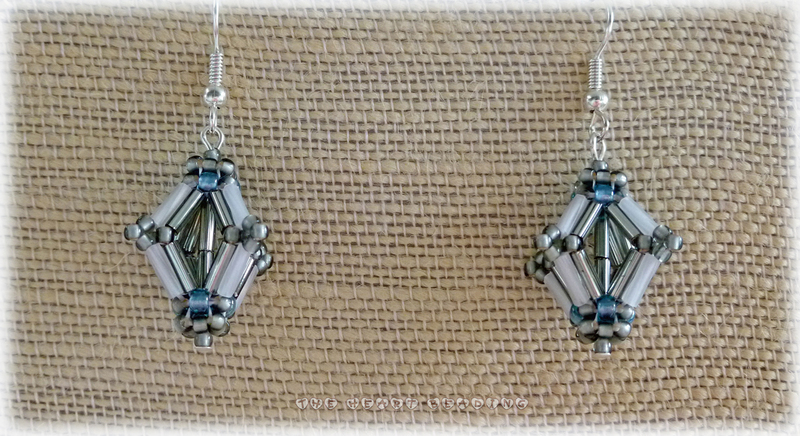 The pattern is called "Gothic Cross Earrings" and it was designed by Kathy. You can watch the tutorial of it HERE. I planned to turn it into a pendant because the bead cones I bought are a bit heavy to a earring. But I made a mistake when choosing the One G thread to make it. The pendant got too floppy. I'll remake it with Wildfire, the same thread Kathy used in her video. Although Kathy shows all the necessary steps to make the earrings, I don't recommend it for beginners. You may have to adjust the amount of seed beads added at the top of the cones. 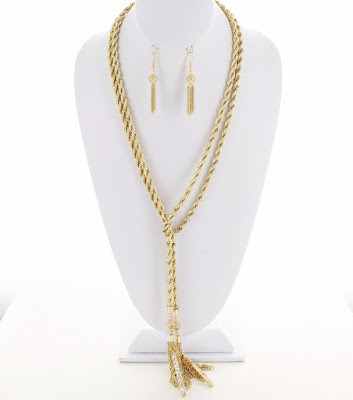 It will depend on the length of your bead cones. 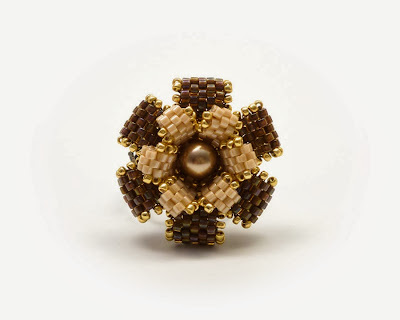 For example, in the original pattern Kathy used 17 seed beads 11/0 in the first round after adding the bead cones. I had to use only 15 and it changed the way I worked in each row after that. That's my version of the Frankfurt Bead-Lace bracelet, designed by Sabine Lippert. The pattern is free and you can download it HERE. Sabine Lippert is a very talented artist. 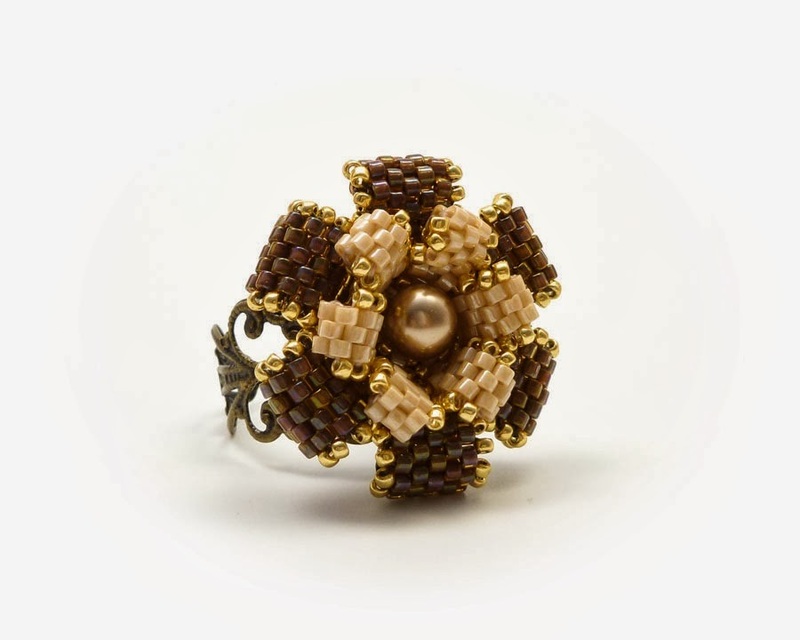 The beadwork pieces she create are impressive. 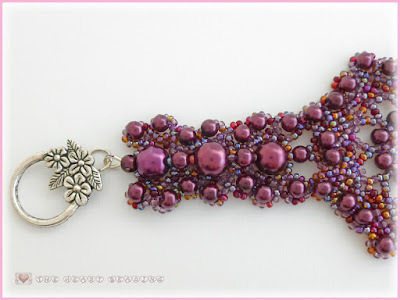 I recently bought her book - "Beaded Fantasies - 30 Romantic Jewelry Projects" - thanks to a recommendation from a reader here on the blog. I love the book and I have to tell you that I'm very impressed by her work. Her designs are very detailed and unusual - what I love. I'll be posting a review of the book soon. 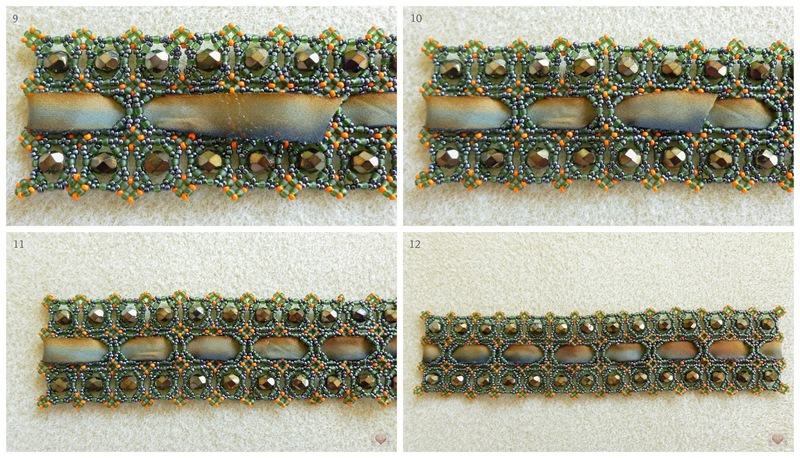 The Frankfurt Bead-Lace bracelet was her first pattern. She recently made some changes on it to renew it. 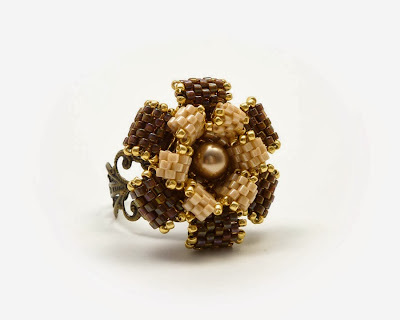 The old version of the pattern is not available at her website anymore, but you can still see photos of it if you search on Google. 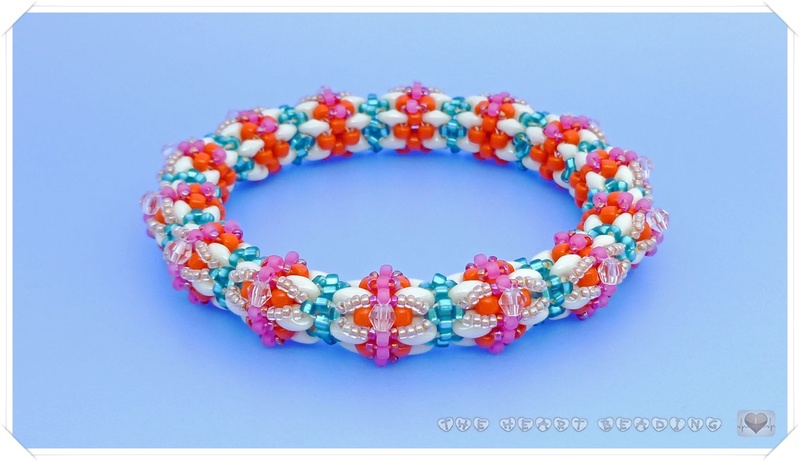 I like the two versions so much that I decided to make a bracelet by mixing what I liked most in the old version with what I liked most in the new one. I also changed the ribbon at the middle of the bracelet. 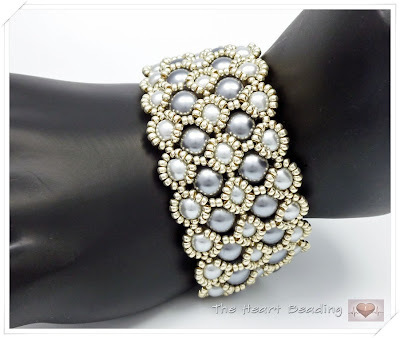 Instead of using it as a embellishment and as a clasp at the same time (like in the original pattern), I glued the ribbon to fix it in the bracelet and added a magnetic clasp with seed beads. After adding the ribbon, I left about 2" or 5 cm of extra ribbon at both sides of the bracelet. 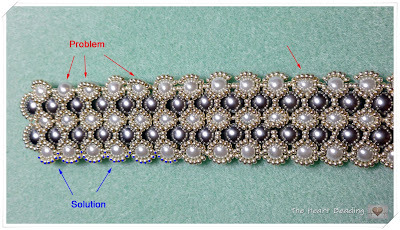 Then I used glue to fix the extra piece of ribbon in the back part of the bracelet, as you can see in the pictures bellow. After drying, the glue is invisible. I also hid the end of the ribbon behind the beads. 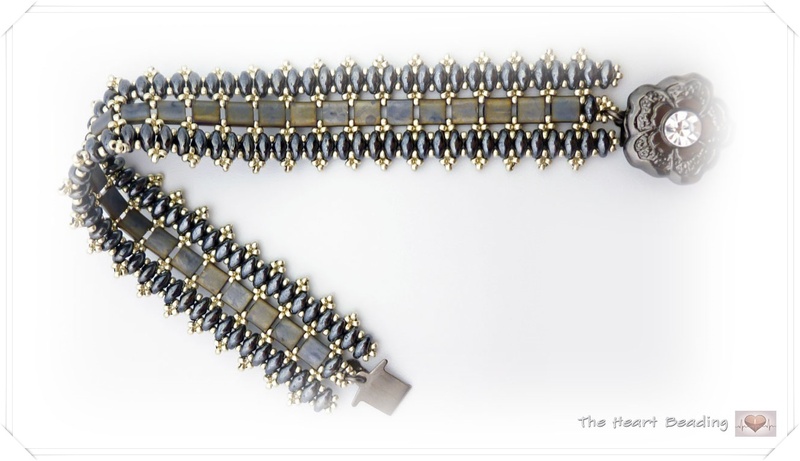 In this way you see no difference between the front and back of the bracelet. Mixing colors is not natural for me. 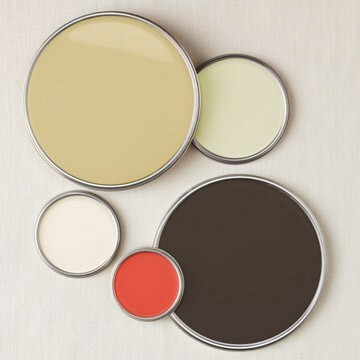 It can take hours for me to choose the colors for a project. So I'm always practicing, pushing myself out of my comfort zone and choosing colors that I'm not used to. 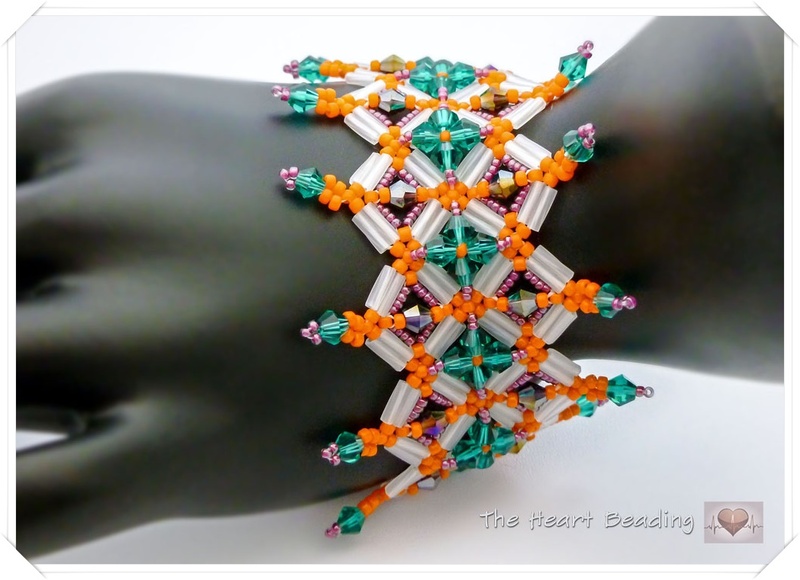 This time, to make this bracelet designed by Maria Teresa Moran (the pattern was published in Beadwork Magazine February/March 2013), I chose orange, green and magenta colors. Because they are all vibrant colors, I used white to create a balance between them. Because I receive many emails from people asking me where I bought the materials I used in the tutorials on YouTube or in the projects I posted here, I decided to put a link to the store where I bought each material. For those materials that I don't remember where I bought or that I bought in auction on ebay, I'll leave without links. 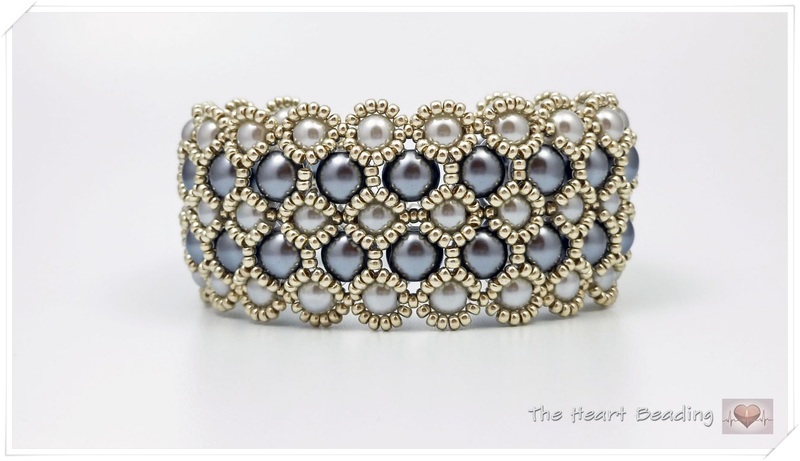 This is my version of the bracelet Nelly, designed by Pucca. You can buy the scheme of the bracelet here. My first attempt to make it wasn't successful. 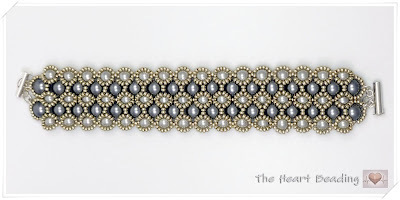 When I added the tila beads, my bracelet wasn't flat. There wasn't enough room to place the tila beads. I took a photo to show you the problem. I searched on the internet to find someone else that had the same problem as me, but I didn't find anything. 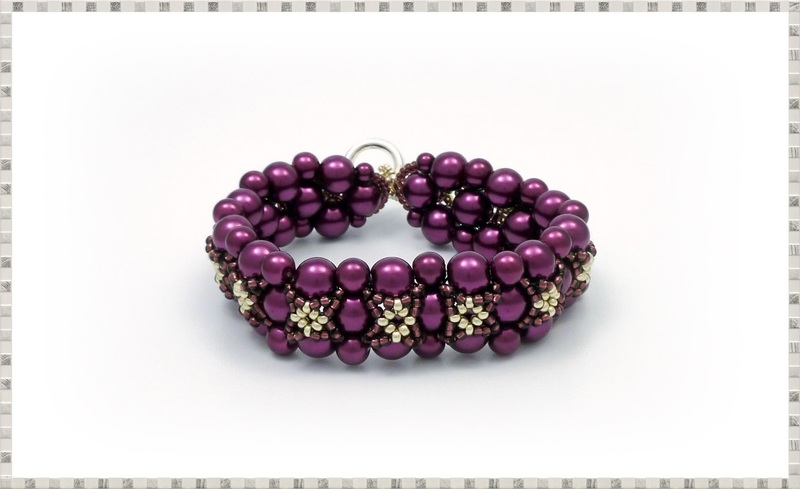 So I undid the bracelet and tried to make it using seed beads size 11/0 instead of 15/0. But the result wasn't nice and delicate as the original pattern. I undid it again. 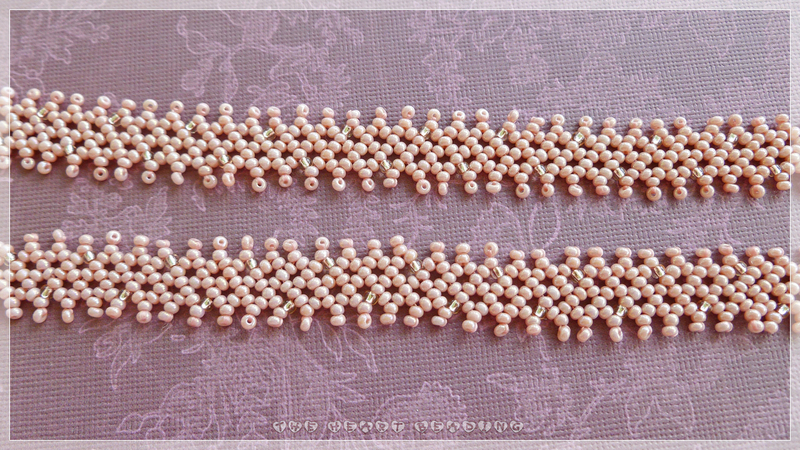 Finally I figured out that I should loose my tension when I was doing the first part of the bracelet. That solved the problem. Keeping my tension loose left more room to place the tila beads. But all this work was worth it! I'm very happy with the result. 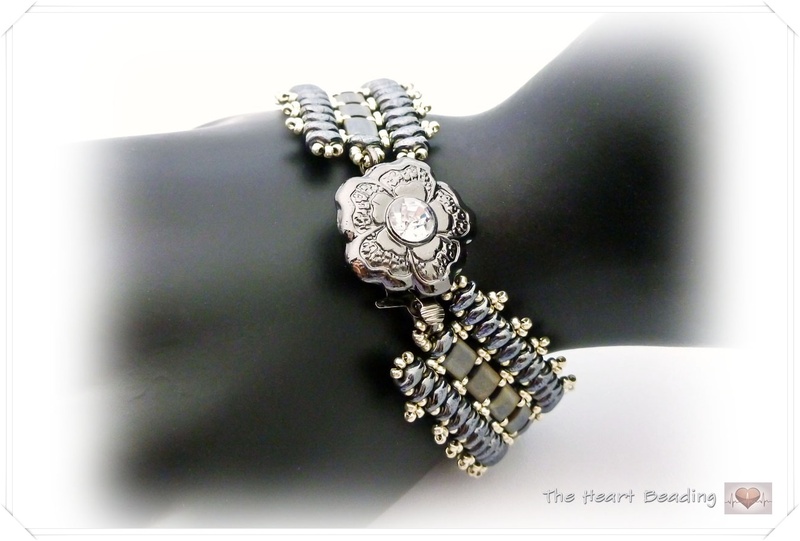 The bracelet is gorgeous, very feminine and delicate. Thank you Pucca for your amazing work!